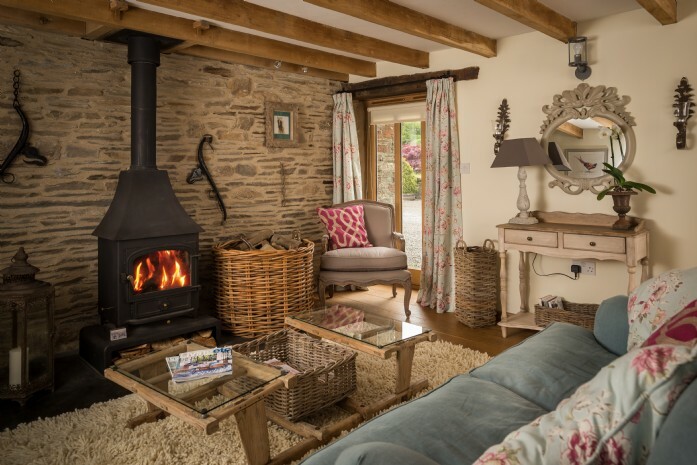 Set within sixty glorious acres of private farmland and cradled by the arms of the Black Mountains, The Wilds offers a truly "in-the-middle-of-nowhere" Welsh escape. 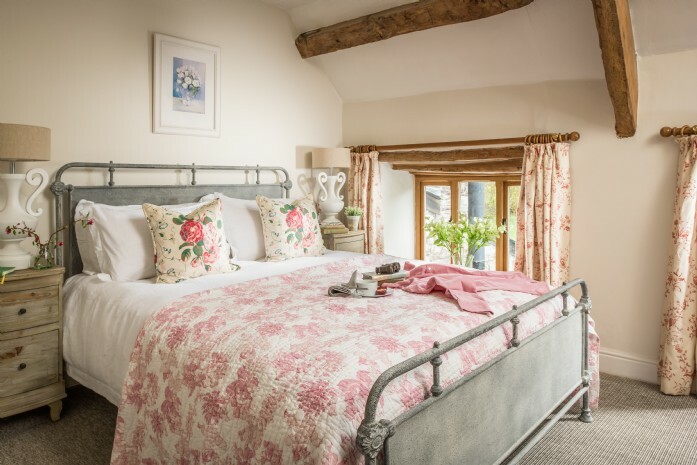 This floral-themed double bedroom is perfectly in-keeping with the picturesque surrounds, featuring a delicate pastel pink quilt, decorative rose print cushions and coordinating curtains. The epitome of Welsh country chic. If you've ever cast eyes on our Victorian country home Florin, you'll know it's like something from a fairy-tale. This stunning Welsh manor house is a rich fusion of opulence and fun, with surprises at every turn. 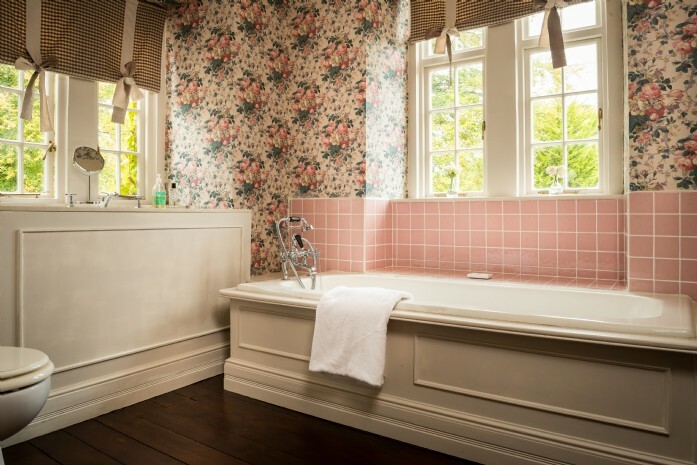 Take this en suite bathroom for example, flaunting traditional wall panelling, gingham blinds, decorative bows, perfectly square candyfloss pink tiles and floral wallpaper as bold and beautiful as it comes. 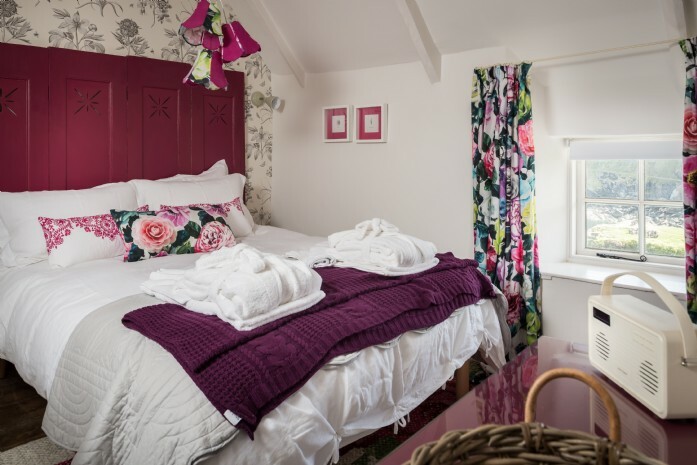 There's no denying that Twelve Penny Barn offers blissful escapism from the humdrum of everyday life, but it's the country-luxe style that really tells you how far you are from the city. Think squishy fireside seating, ornate wood furnishings and delicate ditsy print fabrics sprinkled all throughout. This renovated barn shows how subtle use of floral prints can bring a feminine elegance to a rustic backdrop. Set in over six acres of breathtaking grounds which include a fragrant walled garden, tennis court, wild flower meadow and a Victorian water garden, Honeystone Manor offers unsurpassed luxury in the heart of the Cotswolds. 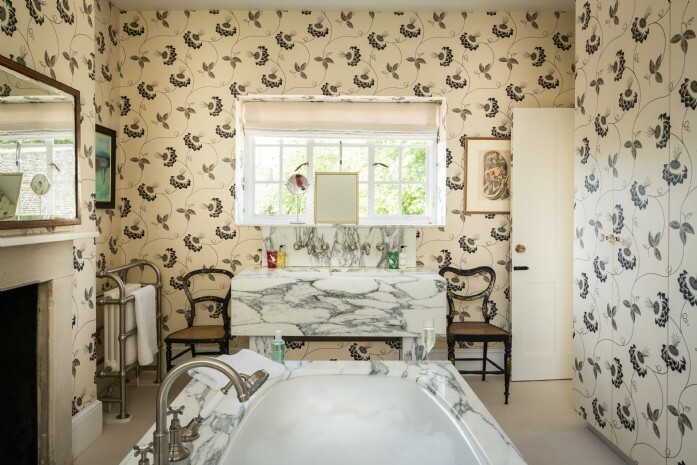 The interiors reflect it's lavish location and no space is left unstyled - even the bathrooms are a work of art. This room (pictured) shows how floor to ceiling flower print can still be sleek and sophisticated if you stick to monochrome. Throw in a matching marble bath and sink for extra indulgence. Once a honeymoon retreat to the fisherman's cottage next door, The Sea Rose not only takes its name from tales of bygone times (once home to a lady named Rose), but also hints at what lies beneath it's charming thatched cottage exterior. The bedroom has a romantic boudoir flavor, mixing hot pinks and bold Designers Guild fabrics. The contrast of the colorful floral curtains with the grey flower print feature wall show how mixing prints can add depth and interest. Blooming marvelous.